I recently worked with a team of content writers, where we had introduced Kanban to help with the flow and consistency of delivery. The cycle time of work had reduced, but it was still high and as a team they seemed a little flat. They knew ‘what’ they were doing as individuals, but not the context of ‘why’ they were doing it. To date we had focused on the workflow, but I wanted to ensure that the environment itself was not de-motivating the team. I decided to use Esther Derby's 6 motivational areas, to build up a motivational profile for the team at the next Retrospective. 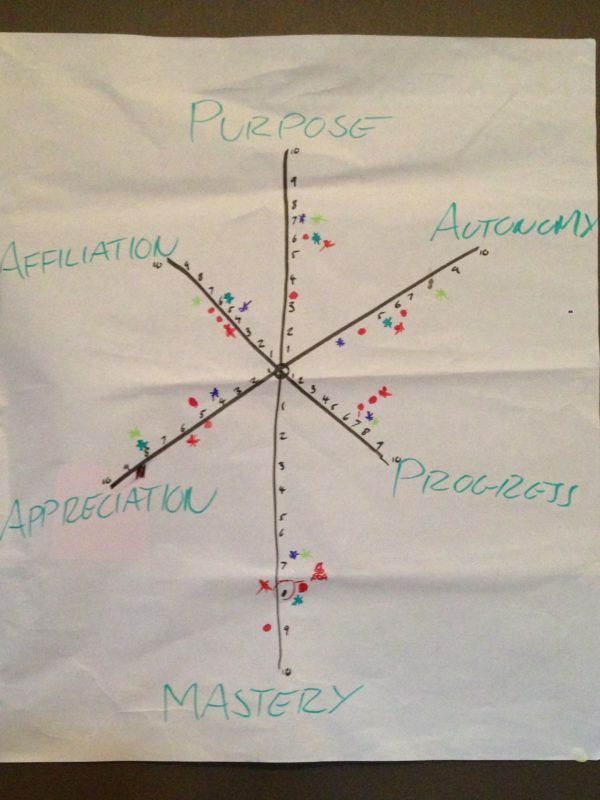 On a second flip chart, I placed the 6 motivational areas, mapped out on a ‘radar chart’ (as pictured). These were numbered from 0 the lowest (at the centre) to 10 the highest (outside). I asked the team members to read the definition for each ‘Driver’, then place a cross (x) where they thought they personally were on the scale (0- 10) for each of the 6 areas. I time boxed this part and when they had finished, I drew and connected a team average across each of the 6 areas. This built up a motivational profile for the team. We brainstormed what we could do as a team to better understand who our customers were and the impact of the work we delivered to them. This led to a set of concrete actions that we could own and implement as a team. The team were animated and really enjoyed the approach, which doubled as a team building exercise. They were motivated to come up with, and own, a set of actions to work more closely with their customers. They were motivated to help motivate themselves and ultimately that has humanized their workflow. The team have since interacted more with the board and their customers and their cycle time has reduced. I would definitely run the exercise again. I plan to re-run the same exercise with this team in several months. We’ll look to compare the results, to measure and see if we have progressed and where we should look to concentrate our next efforts.